History is always a process in the making. This is especially true for the Porfiriato, the controversial period of Mexican history spanning between 1876 and 1911 named after President Porfirio Díaz. During the decades of single party rule that followed the deposition of Porfirio Díaz, historians tended to portray his long presidency as a disruption to Mexico’s seemingly inevitable republican path–a path that, some argued, was being restored with a presidency headed by the Institutional Revolutionary Party beginning in 1929. But as the PRI lost the 2000 federal elections and the country started its so-called transition to democracy, the Porfirian period has become the subject of new and more multifaceted historical, political and social interpretations. 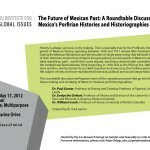 This roundtable discussion chaired by Dr. Garner will explore some of the complex processes that go into the present and future making and remaking of Mexico’s histories and historiographies. For more information about this and other events visit: http://blogs.ubc.ca/genderandsexuality/.